Singapore, 16 April 2010 - Race promoter Singapore GP announced today that the Singapore Flyer will be fully integrated into Zones 1 and 2 of the circuit park for the 2010 FORMULA 1 SINGTEL SINGAPORE GRAND PRIX. This will allow Zone 1 and Premier Walkabout ticketholders complete access to the Singapore Flyer grounds. The partnership with Singapore Flyer allows grandstand and hospitality suite ticketholders at the Pit, Turn 1, Turn 2 and Republic (Turn 3) Grandstands, as well as Formula One Paddock Club and Premier Walkabout spectators unlimited rides (subject to capacity) on the giant observation wheel. 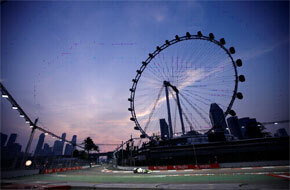 Paddock Club and hospitality suite guests will have dedicated express lanes to board the Singapore Flyer, which offers a unique vantage point of the Marina Bay Street Circuit some 165 meters above the track. The new integrated layout further enables Zone 1 ticketholders to better explore the Circuit Park, which has also been expanded to include the Double Helix Bridge this year. The new Double Helix Bridge offers a fantastic panoramic view of the city skyline and selected sections of the track. For added convenience, a new gate exclusively for Zone 1 ticket holders (including Premier Walkabout) will be installed on the 280-meter long pedestrian bridge, linking the Marina Bay Sands Integrated Resort to the Circuit Park. To further enhance the spectator's experience, Singapore GP will be incorporating live entertainment at the Singapore Flyer premises, such as the outdoor amphitheatre, as well as bleachers* at strategic locations along the trackside for Premier Walkabout ticketholders to enjoy excellent views of the race and the pit entry (*see attached map for Premier Walkabout viewing locations). All Zone 1 ticket holders will continue to have access not only to the exclusive offerings in that zone, but also access to Zone 4's main entertainment stage.